The Lone Star State has a long, proud history of first-rate athletes – and the Texans on the 2018 U.S. Olympic Team are no exception. The accomplishments of the entire team leading up to this point are a testament to their extraordinary talent and relentless dedication. 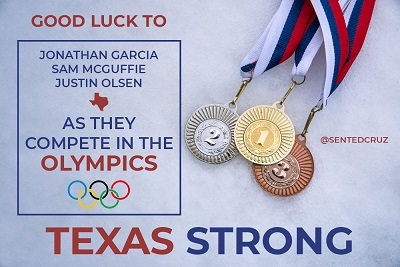 Heidi and I wish Justin Olsen a swift recovery from his successful appendectomy, and we look forward to cheering on each of our athletes as they continue to make Texas and the United States of America proud.